On behalf of the Editorial Board, I would like to thank all of the individuals who review articles for the Journal of the Neurological Sciences (JNS). The integrity of a scientific journal such as JNS depends heavily upon the quality of independent peer-review. I continue to be impressed with the high quality and thoroughness of the reviewers’ critiques of manuscripts. I am especially impressed and thankful that such busy and committed individuals still take the time to review articles. One of my goals for this year is to seek advice from the Editorial Board and Elsevier about how we might be able to recognize the efforts and importance of our reviewers in a more tangible manner. Most readers are becoming aware of the fact that Elsevier, the publisher of JNS, now provides free access to selected articles from JNS for members of the World Federation of Neurology. 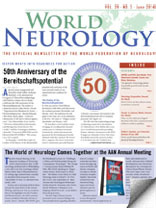 In consultation with members of the Editorial Board, I select two “free-access” articles, which are profiled in each issue of World Neurology.